On the front left tail is the Wilson manufacturer’s tag with washing instructions. Attached to this are three flag tags reading “48” “TAPERED” and “BX”. Adjacent below is a box tag reading the year “89”. Across the chest reads “RED SOX” and on the back is the player number “14”. All numbering and lettering is done in red on navy blue tackle twill. This jersey is properly tagged and was presented to us as team-issued for Rice but does show wear. The Wilson "BX" code suggests the jersey was manufactured in October 1989, which would infer possible Postseason play. The Red Sox did not make the playoffs that season and Rice retired afterwards. The jersey was recycled for usage at a minor league facility the following season. 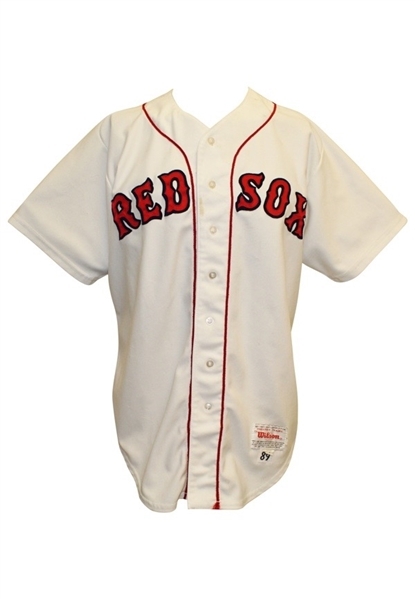 This jersey was manufactured for Jim Rice but the wear can not be attributed to Rice.